Yesterday I wrote about the landmark 1996 welfare reform and its impact over the past 15 years. The reform instituted work requirements and time limits on welfare receipt and changed the way the program was administered. While the new model (TANF) led to some early successes, these have been wiped away by the economic downturn and, perhaps more troubling, the program has proven ill-equipped to buffer families from the harsh impact of the recession. TANF has responded weakly to the increased need brought on by the recession. From the start of the recession in 2007 through 2010, the national unemployment rate increased by 88% but TANF caseloads grew only 14%. Food stamps (SNAP) caseloads, in comparison, increased 60% over roughly the same time period. Of course, not all unemployed people need the cash assistance TANF offers – they may have their own savings to draw on and/or be receiving unemployment benefits. But in one in four states, TANF caseloads have actually decreased since the recession began, a counterintuitive and harmful trend. Welfare reform made it much harder to get benefits. Meeting work requirements is difficult when there are no jobs to be had, and some families may have already exhausted their lifetime benefits eligibility of five years. Welfare reform changed the funding structure of the program to a fixed block grant whose real value (adjusted for inflation) has declined 28% in the past fifteen years. Because federal TANF funding does not change from year to year in response to need or economic conditions,** benefit levels are low and caseloads must be limited. Welfare reform gave states significant freedom in determining how to administer the program and set eligibility requirements, and individual states have exercised this discretion very differently. For example, the share of families living below the poverty line who receive TANF ranges from 8% in Texas to 80% in California. During the recession, some states have significantly increased TANF coverage while others have cut their caseloads. Welfare reform gave states greater flexibility to spend TANF money on items other than cash assistance, such as job development, childcare, and other poverty-reduction measures. While these measures can help create and support jobs, they do not offer immediate assistance to families in crisis. Currently only 39% of TANF funding is spent on direct cash assistance, compared to 73% in 1997. While the intent of the ’96 welfare reform – to encourage employment and reduce dependence on government assistance – may have worked well during the strong economy of the late 90s, it reduced the ability of the program to provide a robust response in times of economic crisis. How might Congress make welfare a better tool for helping people weather future recessions? Allow welfare recipients the flexibility to participate in job training and education instead of work when jobs aren’t available. Expand TANF funding in times of need and increase funding each year to keep pace with inflation. Provide increased oversight of state welfare policies to ensure states aren’t making harsh cuts when individuals need welfare the most. What Role is Welfare Playing in this Period of High Unemployment? 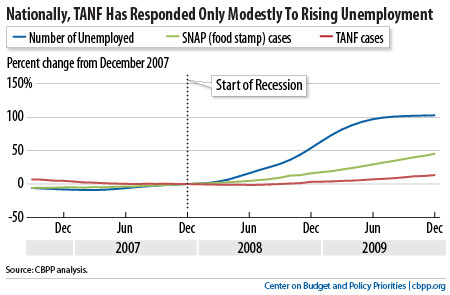 **While the stimulus created a $5 billion TANF emergency fund, it was exhausted within a year and has not been renewed. This entry was posted in Economic Policy and tagged Poverty, Welfare by Diana Brazzell. Bookmark the permalink.